Vel Hynek oil paints original, one-of-a-kind wildlife scenes on slabs of bark-encrusted wood from trees harvested by her husband, Rod. 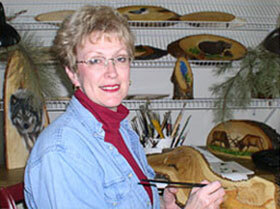 She uses the unique woodgrain patterns, different shapes and colors as part of her composition. This puts the wildlife in their own natural setting. Paintings may be purchased by appointment, email or phone. Please contact us for more information. Vel can be commissioned to create a customized piece of art to hang in your home or cottage or to be given as a gift. Bring us your ideas!